Although it's helpful to get an idea of which common foods are good or bad for you, I think it's more important to recalibrate our intake of the major food groups. Michael Barbee presents one recommendation for overall nutrition (shown here), but he also cautions that the best diet is individualized. Paying attention to how your body feels when you eat certain foods is the best way to develop a personal diet that's healthiest for you. Our bodies' needs also change over time, so we have to be flexible enough to realize that what suited us last year might not suit us tomorrow. 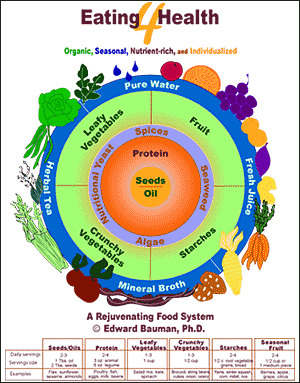 That said, we should all ditch the USDA food pyramid. Michael Barbee suggests that the caveman diet is a good place to start instead when recalibrating our food sensors. Pre-agricultural man got about half his calories from wild game and rounded out his diet with nuts, seeds, eggs, fruits, vegetables, insects, and worms. Dairy, grains, and legumes are newer additions to the human diet, cause many of us problems, and should probably be consumed only in moderation by everyone. As I mentioned earlier, Mark and I have changed our eating habits drastically in the last year. We've lowered our intake of grains, potatoes, and other carbohydrates to one to two servings per day and have increased our fats and protein to fill in the gap. We also boosted fruits and vegetables, aiming for these goodies to fill around two-thirds of our plate at every meal (with a bit more carbs on Mark's plate since he seems to need more.) Astonishingly, this changed dietary regime has stopped many of our food cravings, toning down my chocaholic tendencies and finally breaking Mark free from his dependence on snack crackers. I wonder if we had some kind of nutritional imbalance that got corrected by changing the way we eat? Every so often, the paleo diet comes up in conversations. My problem with it is that the paleolithic man's diet was tied to the paleolithic lifestyle. Which was a life of a lot of cardio, lean winters, breakfast only if there were leftovers from dinner, and generally no guarantee of a meal. There aren't a whole lot of people out there that subscribe to that lifestyle anymore. You've got a good point, but I don't see any part of the paleolithic diet that is less healthy than what the average American eats. Yes, it would be great if everyone was getting more exercise (and maybe if they fasted more, although that's debatable), but being sedentary makes it even more important to eat good food that's high in protein and vitamins. I agree that it is just as important, if not more so, to eat healthy when you have a sedentary lifestyle. I just don't think that the paleo diet actually fulfills those needs. Since paleolithic man was very active and had sporadic access to food, it was very important to have a diet high in fats to pack on the calories. Our bodies evolved to desire fat and to easily store it for that reason. Which does a good job of explaining part of the obesity crisis. From everything I've been researching, it seems like a (commonly held) myth that eating fats make you fat. Yes, fats have more calories per gram than carbs or protein, but they also make you feel full a lot sooner so you eat less of them. Excess carbohydrates are what fuel the obesity epidemic, and they are mostly lacking in the diet of paleolithic man. Some Fats Don't Make You Fat . . . Some Fats Do . . . And Not All Eggs Are Created Equal! Hi Anna! I've quite enjoyed your luncheon series this week, although it did come across rather, as my AP history teacher put it, "a valentine" to Mr. Barbee and his ideas on nutrition. (I got that particular comment myself when I turned in a paper on Eugene Debs where, despite having done thorough research, I chose to focus on only the ideas that I agreed with, was impressed by, etc. Not good history, or good science, heh!) So I was very glad that at the end you did note that, as we're all individuals, no one diet is going to be perfect for every person. After all, even the foods which seem so healthy that everyone MUST need them, can cause problems in large quantities. For instance, my father has a genetic predisposition for forming kidney stones; he has to be very mindful of the amounts of vegetables and fruits which he eats - especially things like broccoli and spinach - because they are good sources for calcium which is usually the main component in a kidney stone. Also, it's important to remember that not only are we individuals with different genetic backgrounds of different ages growing in different environments - all of which can have an effect, whether small or large, on how our bodies use the food we give them. But the food we have access to is also very different. Eggs, for instance, are in many ways a wonderful food full of vitamins, protein and some healthy fats. But the amount of those components varies vastly between, for instance, the eggs laid by your pastured chickens and those laid by factory farm chickens who live their entire lives indoors. And while I agree that one needs fat in one's diet and that too many carbs can cause problems, I think that you're making things a little too simple, especially since carbohydrates are an important component in helping one's body to regulate blood sugar. Certainly the modern American diet is messed up in all kinds of ways, whether one is strictly following the USDA guidelines, or following the path of the far-too-busy and eating lots of processed, pre-packaged foods, or following the path of the must-fit-the-current-image-of-beauty-at-all-costs and eating no fats and no carbs. We, as a stereotype, have a bad tendency to take diet advice and run with it: "carbs are bad? I'll never eat another one," "eggs are good? I'll eat 10 a day!" So it's a bad plan to make any kind of blanket statements when it comes to food, because people will generally assume that if the statement applies at all, it applies all of the time and they'll end up eating too much or too little of whatever the food is and, one way or another, hurt their health. I also must say that I agree with Mr. Antrobus that paleolithic man's diet is probably not the best starting place for trying to figure out the best diet for modern man: we don't have his lifestyle, we've probably lost many of the enzymes he had for processing the food he ate, and frankly, his diet wasn't all that great for him (it wasn't all that bad either, but it certainly wasn't a model of "how to eat for the best health and longest life possible"). Anyway, I guess what I've been trying to say through this overly long and meandering post is that I believe one's best bet in diet, as in many things, is moderation. Eat a varied diet filled with fruits, vegetables, protein, whole grains, fats - some of each, but not overly much of any. Try to cook from scratch and stay away from processed foods full of stuff that isn't really food. Try to get your meat, eggs and dairy from animals who are raised organically and have pasture access (ideally raise them yourself or get them from someone you know and trust, but not all of us can do that). I don't think it's really all that difficult as long as you don't go overboard on any one thing and pay close attention to what you're putting in your mouth! At any rate, you seem to have found a menu that works well for the two of you, and that's great - thanks again for a very interesting luncheon series! I think all of my lunchtime series are "valentines." I don't pretend that I've done exhaustive research on the topics (though I do throw in my two cents when I have related experience.) Instead, they're just brief summaries of the books for those who don't have time to read them (and so that I can go back and look at my notes later.) I certainly don't have time to research all of the topics I toss out there --- these are just eye-openers for each of you to take into your own lives or not as you see fit. Of course everyone should tweak their diet to match what makes them feel good and what suits their body, but the purpose of this series (and the book it was based on) is to debunk some commonly held myths about nutrition, many of which were started by various agricultural lobbies. The "fat makes you fat" belief is one of the beliefs many of us pick up along the way which isn't born out by the facts. I'm sure we can all agree that fast food is a problem, but you'll notice that if you follow the dietary guidelines I outline in this lunchtime series, you wouldn't be eating anything from McDonalds. The food is fried in the "bad fats", the meat isn't pastured, and the white buns are pure carbs. And wouldn't it be easier to deal with your other problem by eating slower rather than by taking healthy fats out of your diet, fats which help keep your body and brain chugging along? I've been eating in a way similar to this myself for about two months now. I feel so much better, have lost 20 pounds and have had almost NO seasonal allergy symptoms. In the past (since moving to the South in particular, about a decade ago) I would have 24 hour periods where I would sneeze 6-10 times in succession every half hour or so, with my nose dripping like a leaky faucet in between. Those days would come once or twice a week from March through October. We're further south than you so our trees and plants have been blooming and folks have been sneezing for about 6 weeks now. I have probably sneezed a dozen times in those six weeks. My husband and kids are still eating some grains but less than in the past and I'm weaning them off sugar too (without the kids really even noticing). We've never been huge sugar consumers but I've done a lot of baking in the past (whole grains, etc) and am not doing that any more. Everyone seems to be thriving and we're all learning to like foods we've never eaten much in the past. I just finished (and highly recommend) Gary Taubes "Why We Get Fat and What to do About It" for a better understanding of WHY carbohydrates make us fat. I had already adjusted my diet before I started the book but it really helps me to make sense of why what I am doing is working and helping me feel so much better. It's a much easier read than his earlier book "Good Calories, Bad Calories" but has a lot of the same information. That one is next on my list. I'm always amazed at how full-spectrum the effects of diet can be on the body. Most people seem to think that as long as you're moderately well nourished, diet has little effect, but I'm with you --- I've noticed that eating lots more fruits and vegetables, more protein, and fewer carbs has made my whole body and mind feel better. I'm thrilled to hear you've got the whole family on board!